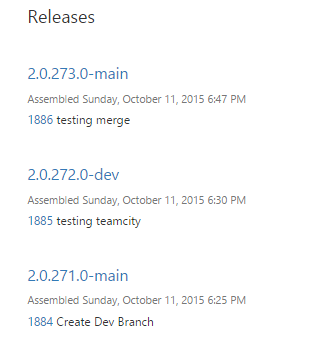 I’ve recently implemented a TeamCity build on one of my old projects in TFVC and was surprised about the branching support in TeamCity is focused around Git and Mercurial for branching. So as per usual i coded my way out of a hole, and here’s how i did it. This is just using a basic example of dev and main branch, but i normally use feature branching for this project too, and version/release branches in some of my other TFVC projects as well. In the VCS root, i use the root of the solution, so it includes all branches when it syncs, as TeamCity “syncs” files with source and doesn’t re-download them all the time like TeamBuild, its not an issue when you have a lot of branches, unless you need to do a clean build. 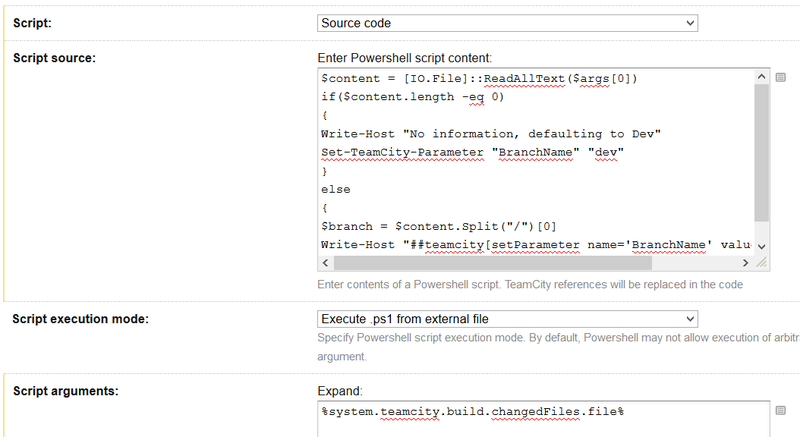 Then Create a PowerShell step as the first step on the Build Configuration. Below example code checks the files that were included in the build change and sets the value for the parameter. If you run a build without a check-in it’s not going to have any changes attached to it, so in this case i default it to the dev branch. Write-Host "No information, defaulting to Dev"
This code will only look at the first file in the check-in, because it assumes you wont be checking in to multiple branches at once. In a subsequent post I’ll go into how to setup steps in octopus to prevent the dev branch from getting release to live.